Dehydrating your grains is a quick and easy process that anyone can do. It helps you to create a backup of your grains or store some extra to share with others. Dehydrating water or milk kefir grains is a good way to create a backup for yourself in case something happens to your main set of grains. The grains have been known to survive up to a year in this dormant state. Dried grains are much easier to ship than wet. You do not need to worry about liquid seeping out of the package you ship them in since they are dry. (Seeping envelopes can be tossed by postal workers if you do not make sure to label them properly.) You also do not need to worry about the grains and their packaging expanding during shipping because the grains are in a dormant state. Rinse your grains to remove excess sediment and solids from fermentation. Water Kefir Grains: rinse with non-Chlorinated water. 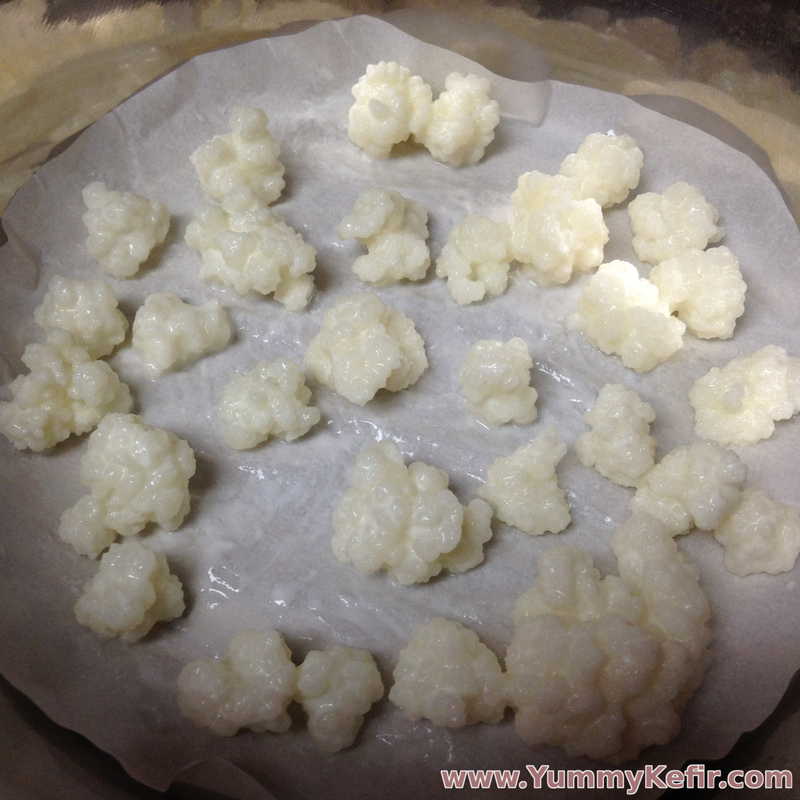 Milk Kefir Grains: rinse with milk. Place your grains on some parchment paper, wax paper or in a clean glass dish. Cover the grains with a breathable cover. The more air, the faster they will dry. However, if you do not cover them, they can attract unwanted attention from fruit flies and the like. Let the grains sit 4-5 days until they are completely dry. After 2 days, turn the grains over to help the underside of the grains dry. Bag and store the grains in the refrigerator or freezer until you are ready to use them again. You can place milk kefir grains in powdered milk to help protect them from the freezer if you are planning to freeze them.